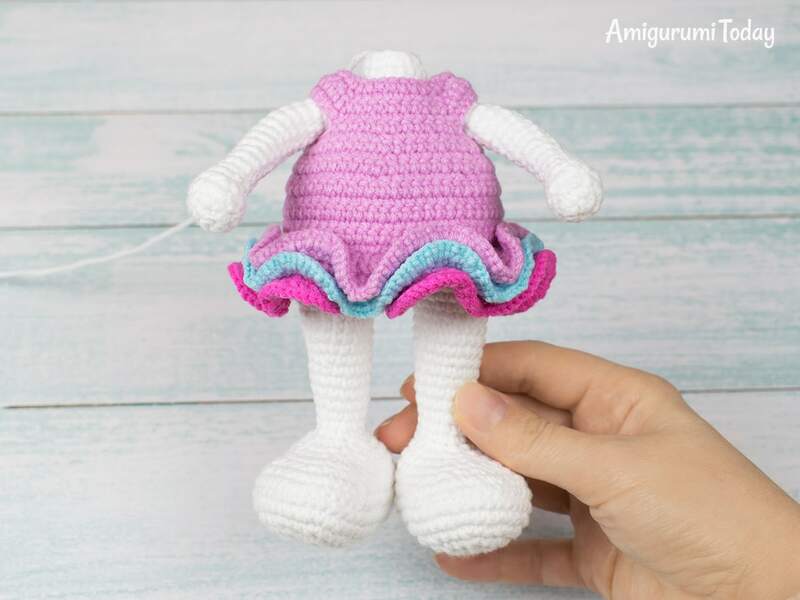 The Pretty Bunny Amigurumi Pattern will help you to create a crochet toy with a lot of cute details. 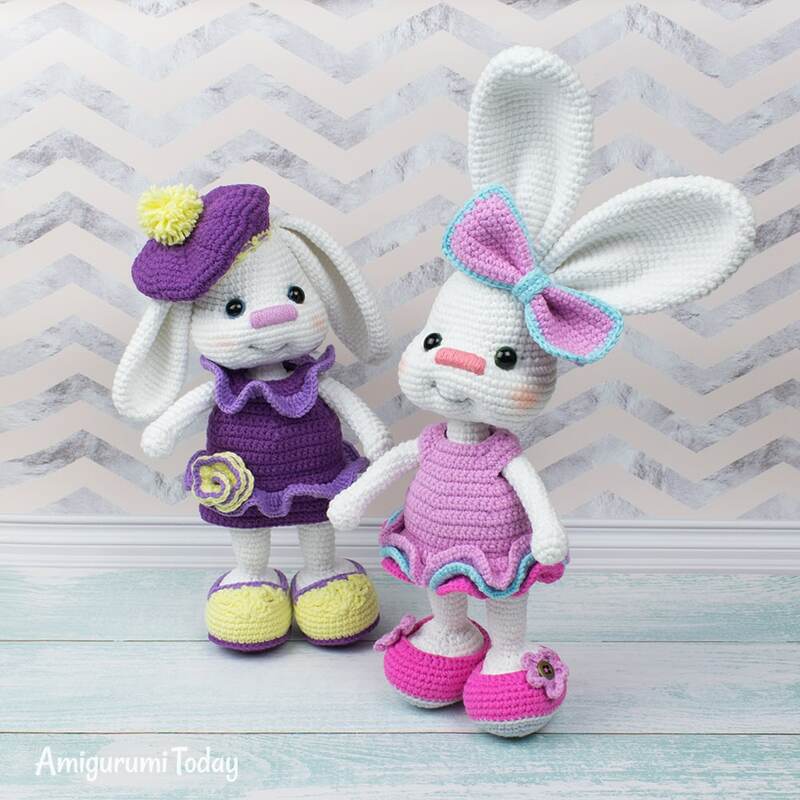 This lovely amigurumi bunny is an ideal Easter gift for kids or for those who’re young at heart! The pattern is of high difficulty. It was designed for advanced skill level crocheters. So, it’s not recommended to start with if you’re a beginner. 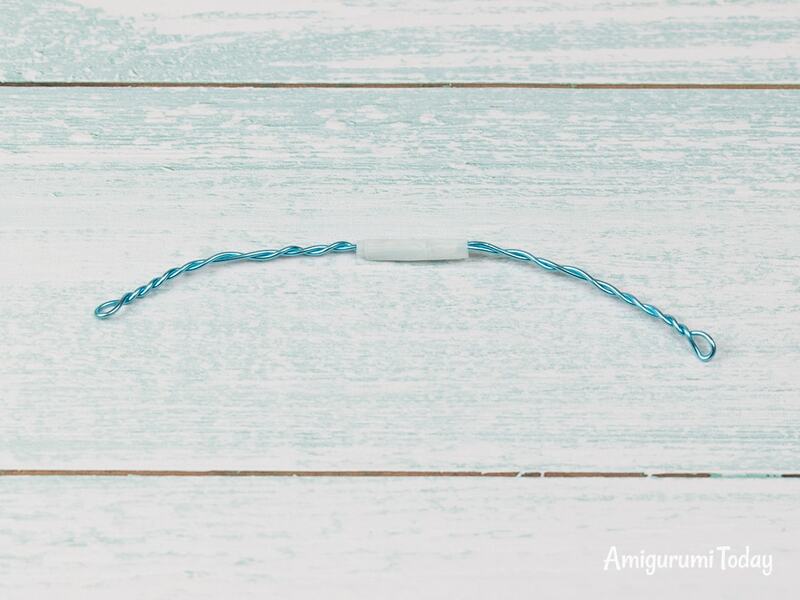 Use a stitch marker to see the beginning of a new round. Follow all the instructions and hints! Stuff the bottom part of the arm slightly. Finish with sl st. Fasten off and leave a tail for sewing. Crochet 9 ch with white yarn. Continue working around the foundation chain, beginning from the 2nd ch from the hook. Finish with sl st. Fasten off and weave in the end. To strengthen the ankle insert cotton swab or round wooden stick in the leg (the bottom part of the stick is located in the foot) and stuff it with fiberfill. Make the second leg in the same way, but don’t fasten off. Continue working on the body. Stuff the body as you go. 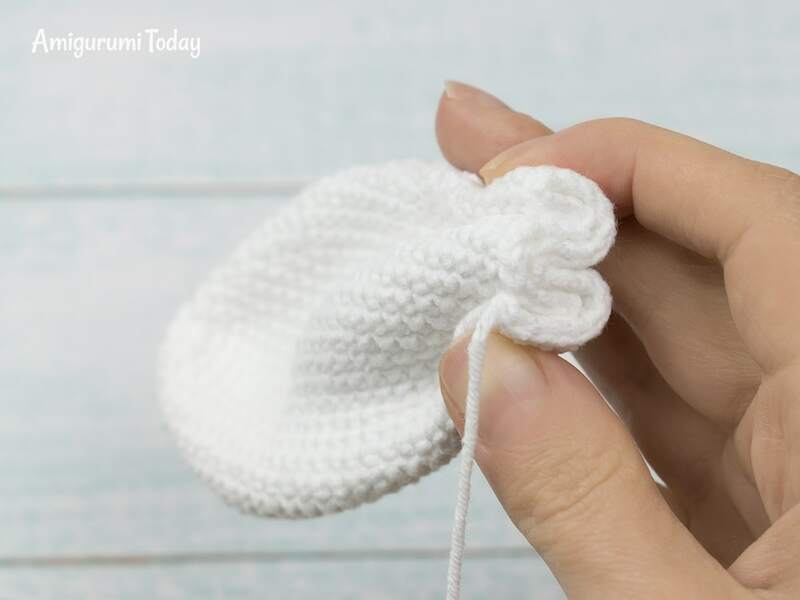 Begin crocheting from the middle point of the inner side of the left leg. Rnd 26: (sc in next 5 st, inc) repeat 3 times, 3 ch, on the right leg (from the inner side): (sc in next 5 st, inc) repeat 3 times. If you want the arms to be bendable, make a simple wire carcass. Insert it in the next round like it’s shown in the picture. If the wire has no coating it’s better to wrap it with fabric sticking tape before sewing the arms. Sew the tail to the body, adding some fiberfill inside the tail before you finish. Find Rnd 15 on the muzzle. Then find 4 sc between the increases. This is the center of the muzzle. Take it into account when placing the eyes. Insert safety eyes between Rnd 14 and Rnd 15, at 10 st in between the eyes. Don’t fasten the eyes with caps, as they can prevent from making muzzle indents. You will secure the eyes with a drop of crystal glue when the indents are done. Finish with sl st. Fasten off and weave in the end. Stuff tightly. Upper points are between Rnd 15 and Rnd 16. Lower points are between Rnd 17 and Rnd 18. Pin #5 is placed between Rnd 20 and Rnd 21. Pin #6 is placed between Rnd 21 and Rnd 22. Pin #7 is placed between Rnd 22 and Rnd 23. Pin #8 is placed between Rnd 23 and Rnd 24. Point #1 is located under the left safety eye from the left. Point #2 is located under the left safety eye from the right. Point #3 is located under the right safety eye from the right. Point #4 is located under the right safety eye from the left. Step 1. 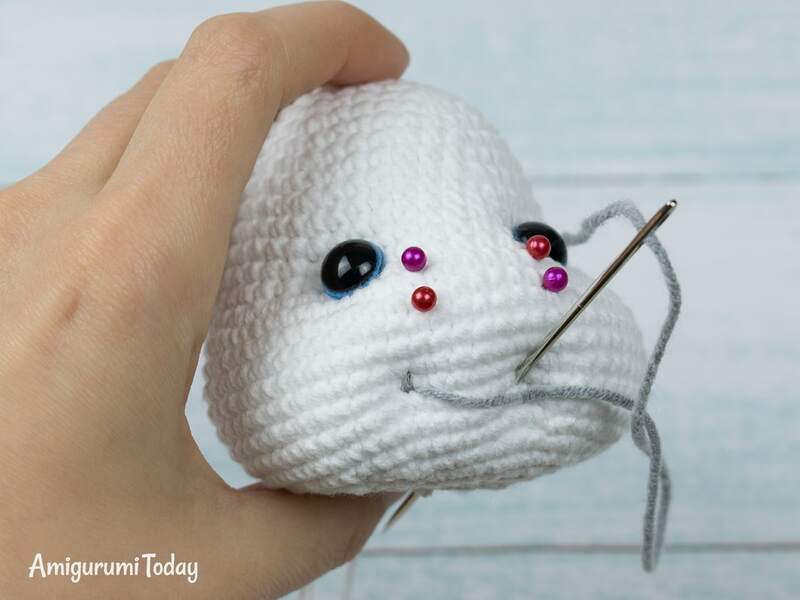 Take a long needle with white thread, make a knot at the end of the thread. Insert the needle from the inside (through the neck hole) and draw it out the Point #1. 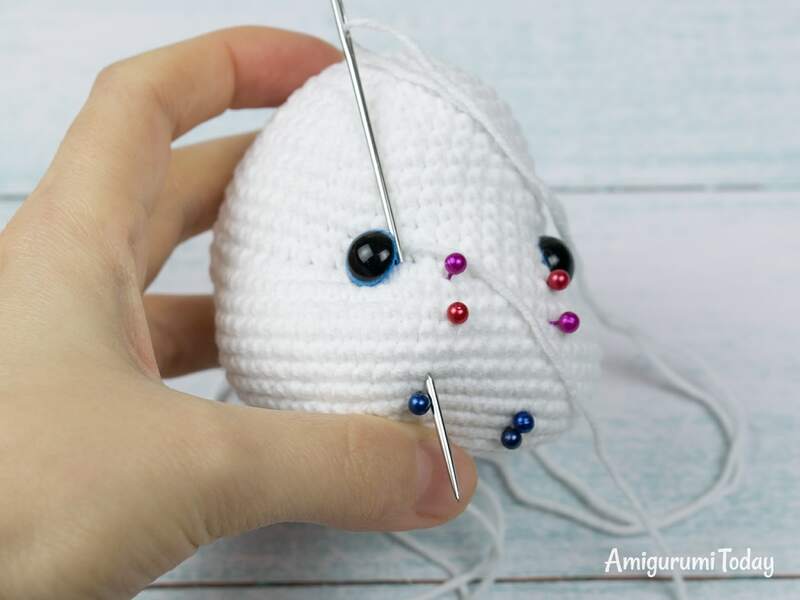 Step down a little bit (to seize the stitch) and insert the needle near the Point #1, then draw it out the Point #3. Pull slightly. Step 2. Insert the needle in the Point #4, and draw it out the Point #2. Pull slightly. Step 3. Step down a little bit and insert the needle near the Point #2, and draw the needle out the Point #5. Step 4. Insert the needle in the Point #6 and draw it out the Point #1. Pull slightly. Step 5. Insert the needle in the Point #2, and draw the needle out the Point #4. Pull slightly. Step 6. Insert the needle at the Point #4, and draw it out the Point #7. Step 7. Insert the needle in the Point #8 and draw it out the Point #4. Pull slightly. Step 8. Insert the needle in the Point #3, and draw it out the neck hole. Pull slightly and fasten off. Step 1. Take the needle with gray or black thread, make a knot at the end of the thread, and insert it in the Point #6 from the inside. Step 2. Insert the needle in the Point #8 and draw it out the neck hole, forming a smile stitch. Step 3. Again insert the needle in the Point #6 from the inside. Draw it out. Step 4. Insert the needle in the Point #5 and draw it out the Point #8. Step 5. Insert the needle in the Point #7 and draw it out the neck hole. Fasten off and cut off the thread. Check that nose pins are in place after making indents. Correct their location if it’s needed. Step 1. Embroider the borderlines of the nose. Check that the stitches are even. Step 2. Embroider the second layer with vertical stitches very neatly and evenly. Insert the needle into the toy right between the rounds, giving the nose a nice shape. Hide the end inside the toy and fix it. The head is done! To fix the eyes reliably, glue them to the head with a drop of the crystal glue (optional). Work with white yarn. Don’t stuff. Fold the ears like it’s shown in the picture and pin them on the top of the head, then sew them on. Crochet 57 ch with light pink yarn. To make the upper part of the dress: turn and make 2 sl st on the side of the last dc st, continue working on the opposite side of the foundation chain. Note: Crochet in ending straight rows, turn and start each following row with 1 ch. Row 12: sc in next 6 st, 10 ch, skip 8 st for the sleeve, sc in next 12 st, 10 ch, skip 8 st for another sleeve, sc in next 6 st.
Row 1: sc in all 55 st in back loops only. Fasten off. Go back to the beginning of Row 1 and attach pink yarn to the back loop. Sew the edges of the bottom part of the dress together and continue working on the frill. Use three rows of front loops on the bottom part of the dress to crochet frill. Each frill consists of 2 rounds. Rnd 1: inc in each loop till the end of the round, join with sl st.
Rnd 2: (sc in next st, inc) repeat till the end of the round. Fasten off and hide the tail. Sew the head to the body. To strengthen the neck, insert 3-4 cotton swabs or round wooden stick in it (the upper part of the stick is in the head, and the bottom part is in the body). Add some fiberfill in the neck before you finish. Crochet 9 ch with gray yarn. Continue working around the foundation chain, beginning from the second ch from the hook. Place the marker in the middle of the back part of the shoe, and start the next round from this point. Crochet in magic ring (2 ch, 2 tr, 2 ch, 1 sc) x 5 times. Sew the flower on the shoe like it’s shown in the picture. Sew on the button in the center of the flower. 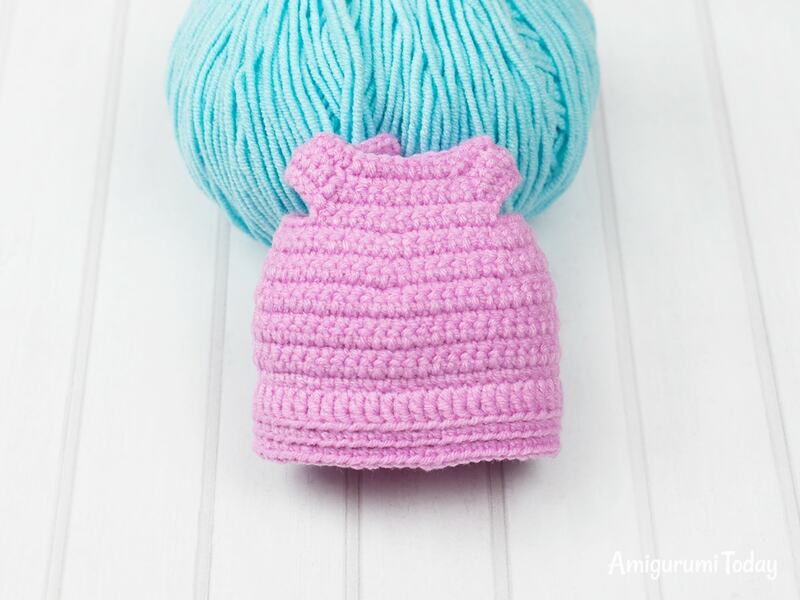 Make 26 ch with light pink yarn. Continue working in rows from the 2nd ch from the hook. Join blue yarn and crochet sc along the edges of the rectangle. Crochet 10 ch with blue yarn. Wrap this blue part around the center of the bow and sew the edges together on the opposite side of the bow. Sew on the bow near the ears. That’s all. 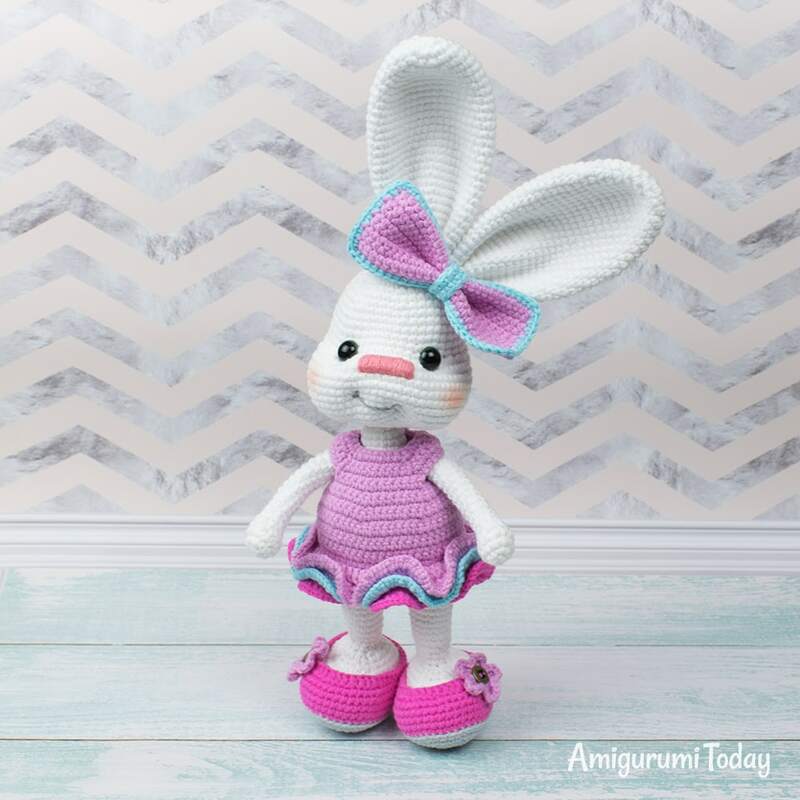 Your pretty bunny amigurumi is done! Congrats! I am stuck on row 26 the joining of the legs i do not Understand at all. Please use a drop of crystal glue from the inside. Please explain round 26 on body I’m totally confused!! Thank you!! Hi Crystal 🙂 In this round you’re going to join the legs. 1) crochet on the left leg: (sc in next 5 st, inc) repeat 3 times. 3) and continue working on the other leg, beginning from the inner side of the leg: (sc in next 5 st, inc) repeat 3 times. Thank you very much for your pattern. I sm working in the head and wondering how to secure the eyes if the backs aren’t put on. Is the glue supposed to be strong enough to keep the eyes from coming out? I really love this pattern and I’m makeing three of these, but I’m having issues attaching the head to the neck. The head and neck get floppy on me. Are there any video tutorials available anywhere to help in the areas were most people are having issues? Please insert a wooden stick or cotton buds in the neck area. Just finished my bunny wanted to thank you for putting it public. It was my first pattern like this to follow got really good at counting. Lol had the same problem as others with the head so I added more stitching around the neck it helped. I have just made this as an Easter gift for my niece. 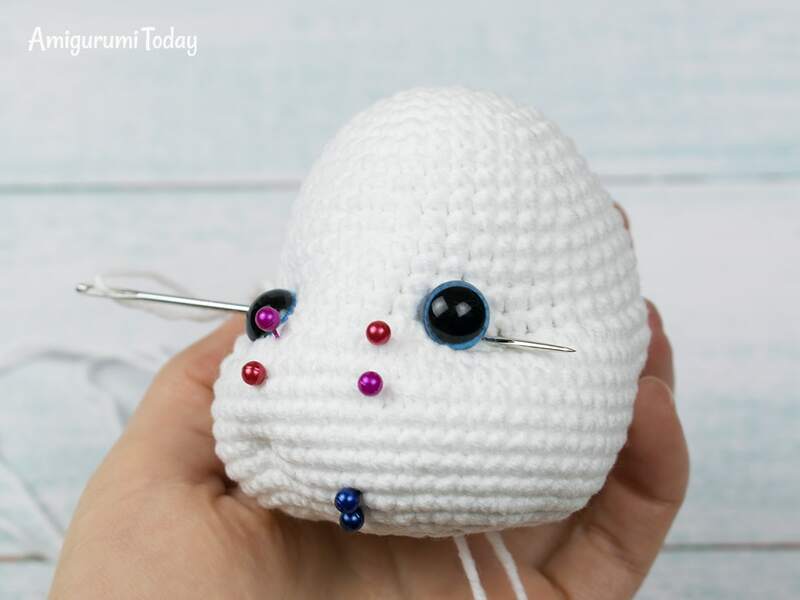 I thought the pattern was very easy to follow and the finished bunny is just gorgeous. Many thanks for the pattern. Do you have a video tutorial for the legs?? I’m not getting the bottom of the foot worked in rounds?! I am also stuck on the ruffles…I dont know how to get that third color on there!! When i did the first and second row, i had stiches to go into, but my third row of ruffles do not have anything I can stitch into….help! Hi 🙂 Please use first round of the front loops on the dress to attach the yarn and crochet the first frill. Then again attach yarn to the next round of front loops on the dress and crochet the second frill. The third frill is the same principle. Hi there. Thank you for this amazing pattern. I’m just confused about the frill part where it says use three rows of front loops then say each frill consists of two rounds which are then mentioned. Do I go to R1 and R2 and use front loops or what’s do I do next after attaching both ends. bonsoir, vraiment très joli modèle!! je viens de faire les bras sans aucun souci et je me lance confiante dans la confection des jambes et des le premier rang je ne comprends strictement rien aux explications, je ne sais comment faire, pour tant ce modèle est tellement mignon!!! juste triste de ne pouvoir continuer!! Hi, I am stuck on the rows of ruffles for the skirt. Can someone post a video? Thanks. I am attempting to make this bunny. How do you attach the arms when you don’t use wire? I am not following how to do this. Also, how do you do the ruffle along the edge of the dress? mine is not looking like the pictures. Hi Diane, all things you requested are described in the pattern. I love this bunny!!! Is there a bunny boy outfit by chance?? I WAS WONDERING THE SAME THING. I JUST FINISHED THE GIRL BUNNY FOR MY NIECE TO ADD TO HER EASTER BASKET AND NOW AM WORKING ON ONE FOR MY NEPHEW. THIS IS BY FAR THE CUTESTS PATTERN I’VE DONE SO FAR!! Is there a video of this pattern, if not would someone please make and share a video, love this pattern just a very visual learning person. Gostaria muito de fazer essa coelhinha mais pra mim mais fácil seria se tivesse um video mostrando passo a passo . I was wondering about how many yard or skin of each color do you need to do the project, I see that you listed fine (4ply) but not how many of each skin nor the name of the color yarn you used. Do you ever sell the completed product. 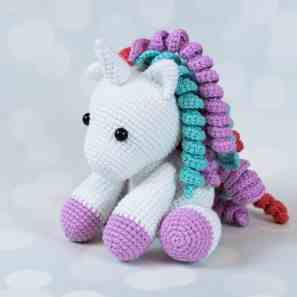 I would love this for my new granddaughter for Easter but do not crochet and do not have anyone in my area that does. Just wondering if I could purchase a completed one. Jane Reynolds – My name is Missy Kleinhans and make these bunnies to sell. You can contact me at [email protected]. I also have a facebook page under my name and under the name Hats and more By Granny! I would love one! They’re so darn cute. I don’t crochet. I wish I did. Do you have any? Jane I am working on one now. I have a facebook page GrammaChebby’s if you would like to see my work. I will post a picture when I have finished the bunny. If you would like to place an order you can leave a message on my page. Jane, I am working on my 5th one. I would love to fill an order for you. Let me know if I can help you. Jane did you find someone to make the bunny for you? If not contact me I can help. I have Facebook. Mary Bradley fleets. 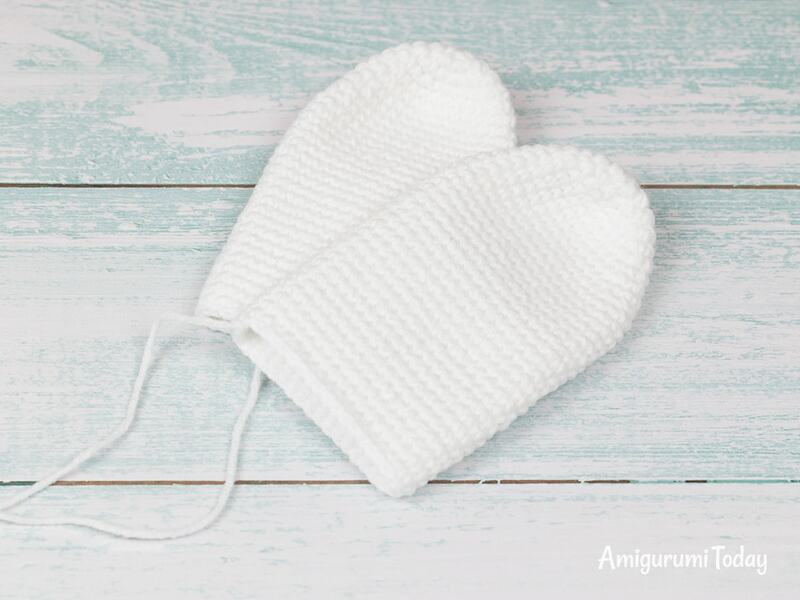 do you have a pattern for these in a knitted version??? i have just finished making this , i am so in love with it !! 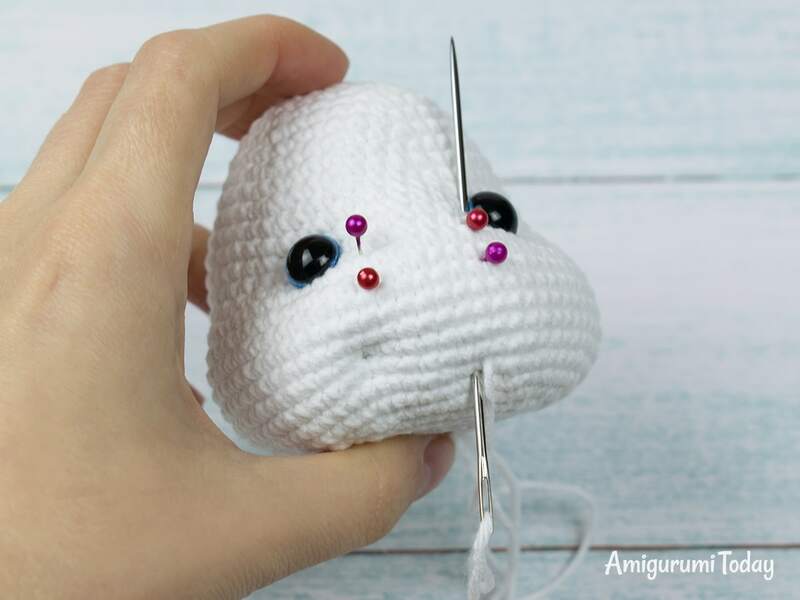 amigurumi hoy podrías crear algún vídeo tutorial donde enseñes a hacer los bordados de los ojos,boca,cejas y nariz. However I can not get the head to fit on the body without it flopping forward. Do you have any tips or advice on how to stop this!? I love this pattern, so thank you. I started this about a year ago, I’ve made the body & head, I choose not to use wire, is there anyway I can stop the head flopping forward. Do you have any hints & tips on what I can do??? You can strengthen the head with cotton bud sticks or wooden stick. I dont understand the shoe instruction on row 11 &12. Are you fastening off after 11 before starting 12? Please don’t fasten off, just mark the beginning of the round in the middle of the back part of the shoe. Merci pour ce tuto, je viens juste de finir Miss Bunny. Je redoutais un peu la difficulté au niveau du visage, mais finalement avec toutes ces explications claires je suis contente du résultat. Where can i find the pink-blue dress? I cant open the community’s link. Hola que tal. Es la primera vez que hago contracciones . Quisiera saber si las contracciones de los ojos y de la boca son independientes en cuanto al hilo o sea corto y anudo en mas de una vez como se explica en el video de youtube proporcionado para las mismas. Quisiera saber también si cuando comienzo a dibujar la cara es lo mismo que la contraccion, tienen alguna relación. En cuanto al numero descrito corresponde a donde debo pasar la aguja. Desde ya muchas gracias por la ayuda. Amei seus amigurumis!! Você tem mãos de fada, Parabéns! !Obrigada por compartilhar conosco!Deus te abençoe, sempre!!! Como eu crio um conta? Gostaria da receita do vestido de três saias. Oh, these bunnies are so cute. Thank you so very much for sharing the patterns for others. Lace. Skirt graphic. 4 Treble in one stitch or 4 in each next stitch. Hello! Bought the pdf version. I’m trying to make the multicolored dress (bodice in purple shown in pictures) would like to have that pattern if possible! Thank you! I bought the PDF copy and was hoping you could provide the pattern for stripe dress. I see a link in response to someone else but can’t seem to get in. Thank you. The upper part of the pink dress is crocheted the same way as others. The lower part consists of three skirts. They are knitted (not crocheted ) with garter stitches. You can crochet them using the second dress pattern (which is on the bottom of the pattern). Just make three skirts of desired length. I can’t find the dress pattern for the ruffle dress with an owl. 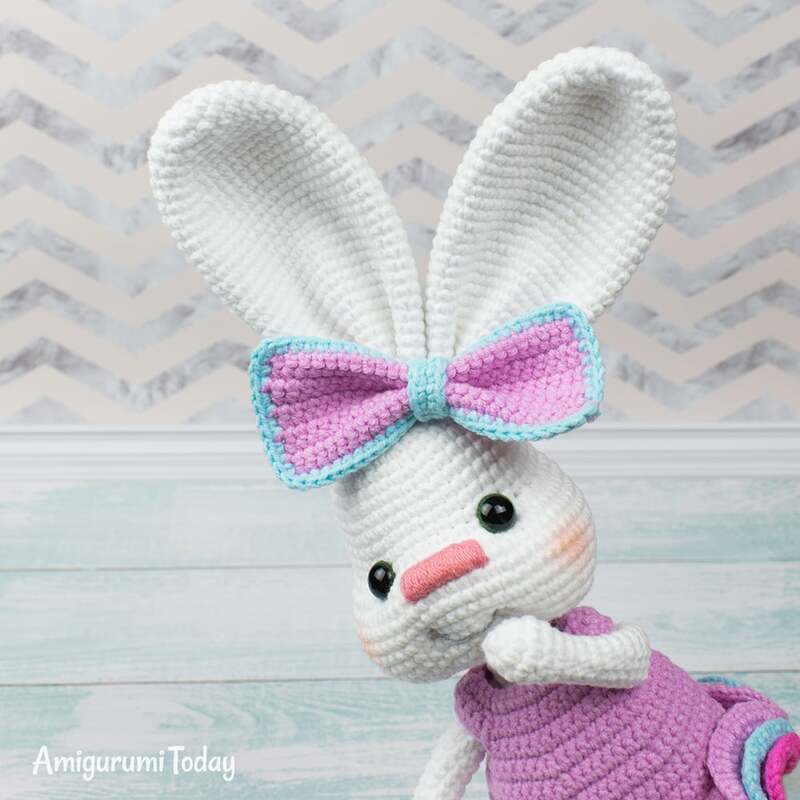 Do you have a video on how to make the wire frame for the pretty bunny in a dress. Also the thickness and where can a person purchase the wire? Hi I am not a very skilled crocheted but I loved the bunny so much I decided to try making her. 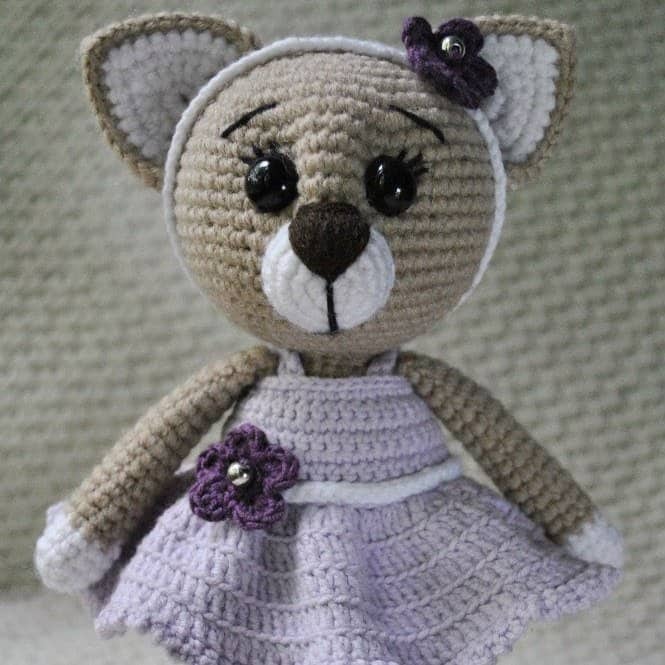 So glad I did, she turned out really well, thank you for the adorable pattern, wish I could send you a picture of her. 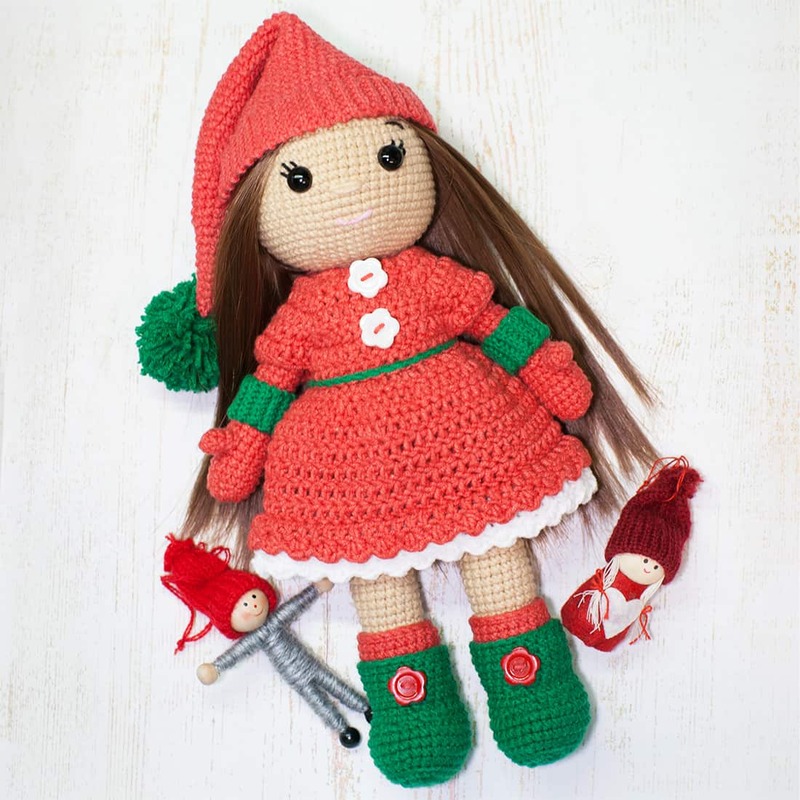 Hi Sherry, you can use thicker yarn and bigger hook to achieve the bigger size of a toy. I was hoping you could tell me what yarn and in what colors was used for the blue and pink ruffle dress? Or do I need to purchase the pattern to get this information? Hi Krystal, unfortunately, yarn labels were not saved. Darn, I have to order this yarn from overseas so I’m not too familiar with it. I’ll seems to all be made out of the same kind so I’ll give that a try and see if I can pick some close colors. Thanks! Super cute pattern. Yes, you can make it without wire frame. In this case the limbs won’t be bendable. Thanks! Just dont want a newborn getting injured if the frame moved! Olá, Boa noite, gostaria de saber se os as reias em PDF estão em português, pois estou interessada em obter o mesmo. Hi Tatiane 🙂 The patterns are only in English. Thank you for this beautiful pattern. It’s lovely. I would really like to have the pattern for this dress. Where can I find it? I’m looking for this one too! Hello! Can you please help me to the round 46 of the body. I don’t Know how to make the “loop” around the wire for sew the arms after. I have a question about the crochet hook. Is the 1.5 in US, if not, what would it be in US? The hook is 1.5 mm. 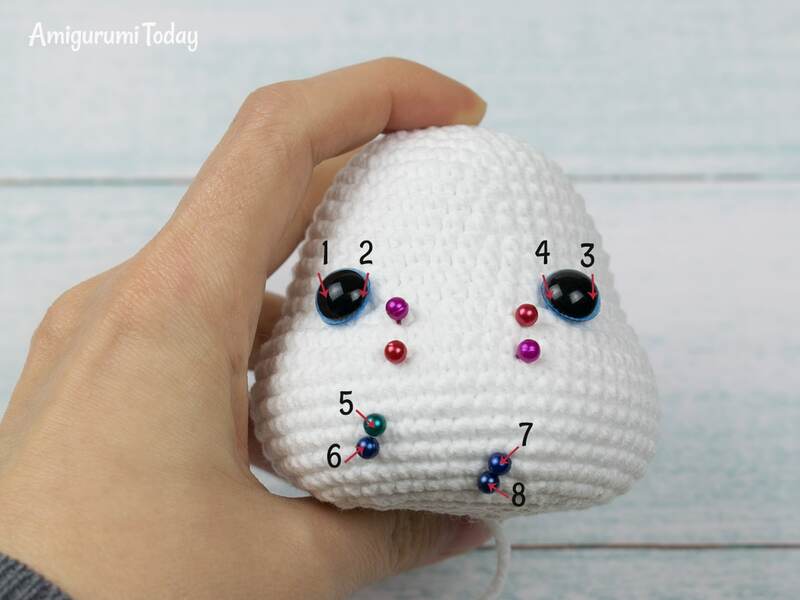 According to this chart http://www.marymaxim.ca/needle-hook-size-charts it’s number 7 steel crochet hook. I having a hard time getting the ears to come out right .im fine up until you get to row 3. Second row you end with 12 and then the next you should end with 18 .i only come up with 15 when I do it. I’m not sure what I’m doing wrong .please help. im having a problem with rd 9 of the legs. according to my math it would be over 100 stitches for the round equaling about 3 rounds not 1. please clarify for me. Hi :), please repeat only the spaces given in the brackets and pay attention to commas. Hi Tonya, legs are made from the bottom (feet) up. 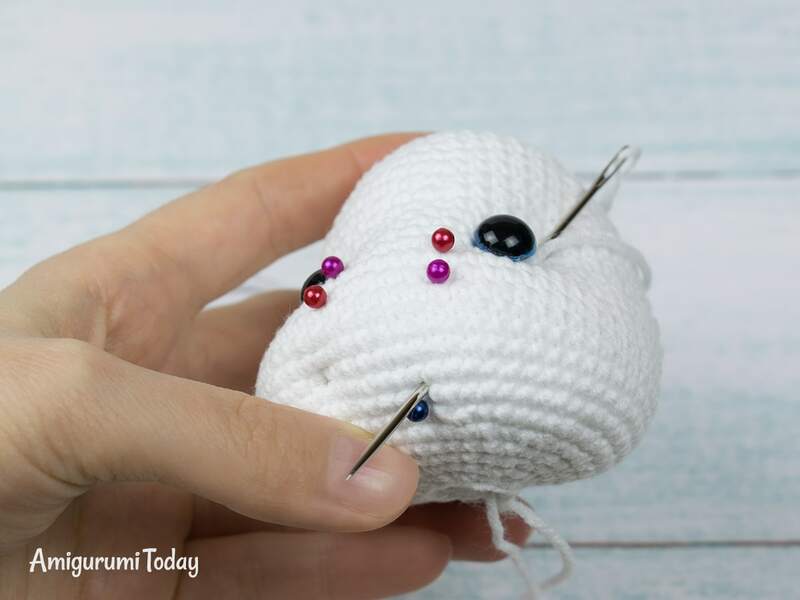 You should make 2 separate legs, then join them and continue to crochet the body. If I sc 5 stitches, then inc and do that two times thats 14 stitches. Then sc 11, then inc and do that 2 times, that’s 26 stitches, then sc next 6. Altogether that is 14 + 26 + 6 which is 46 stitches. Hom am I reading this wrong, please help. Thank you! Hi :), please repeat only the spaces given in the brackets and pay attention to commas. “Sc in the next 5 st, (inc) repeat 2 times” means that you should crochet sc in next 5 st, then increase two times. I am struggling to make the face on this gorgeous bunny. Please can you tell me how many stitches separate points2 and 4. My eyes seem too far apart at the moment. I wish I could send you a picture so you could tell me where I have gone wrong. Thank you for an amazing pattern. I have made the rest of the bunny with no problem. Hi Celia, there are about 10-11 stitches between points 2 and 4. Hi, I have just finished making this bunny and she is beautiful, the little girl she was for is glassy eyes over her but her older sister wants something similar, she loves mermaids but the only ones I can find are no where near as pretty as your bunny. Do you have a mermaid pattern please? This really is a lovely pattern I have used a bigger needle and an 8 ply cotton to make this project for my first grandchild. I am also not using wire. I have looked through all these comments and I am still having an issue with the muzzle and row 15. Is this just a row of crochet on top of the face? I have found the 4 chain and marked my contraction points but I have no idea where to start the inc 12 in the front loops. I just cant see what this achieves on the face. I have read and re read the pattern but am still at a loss. This is my first amigurumi and I think I am hooked but I have hit a road block. I would appreciate any help . Thanks for sharing this lovely gift. Thank you for your response I will give it a go. Hi. I also struggle with the muzzle. Reading your comment I still don’t understand how to do this. Is this round on top of the original 15th round? Hi! This pattern is great! I’ve completed 2 rabbits already. I am starting my 3rd now and have a question regarding the dress pattern is wish to do. It is the one with the shorter purple top with the orange tie and the multicolored bottom in vertical lines. I found the link from a previous post on here. Thanks so much for that! But, I was wondering if you make 2 of the pieces that the pattern shows? Just looking at the pic doesn’t look like it would be big enough to go around bunny. I’m not very good without having a written pattern so I’d appreciate any help and info you can give me regarding this. Thanks in advance. I am wondering if here is some place to get directions on how to make the wire carcass to put in the bunny. I have never done anything like this and don’t know where to start on forming it. How do you know where to make the bends and how long to make the arms and legs? What size wire do you use? Are there instructions/directions any place? Hi Cynthia, crochet the body till the arms, and you will see the size of the wire carcass you need to make. Hi, I’m on row 9 of the legs and am a bit confused with the instructions. I am coming up with 6 stitches left after following the instructions. It says sc in the next 12 st,(dec) repeat 9 times, sc in the next 12 st  I still have 6 stitches left after doing this…please help, what am I doing wrong? Hi Lori, please check if you follow the previous instructions in the right way. Omg!! this bunny pattern is darling,I made it ,,, Now im making secong one.. 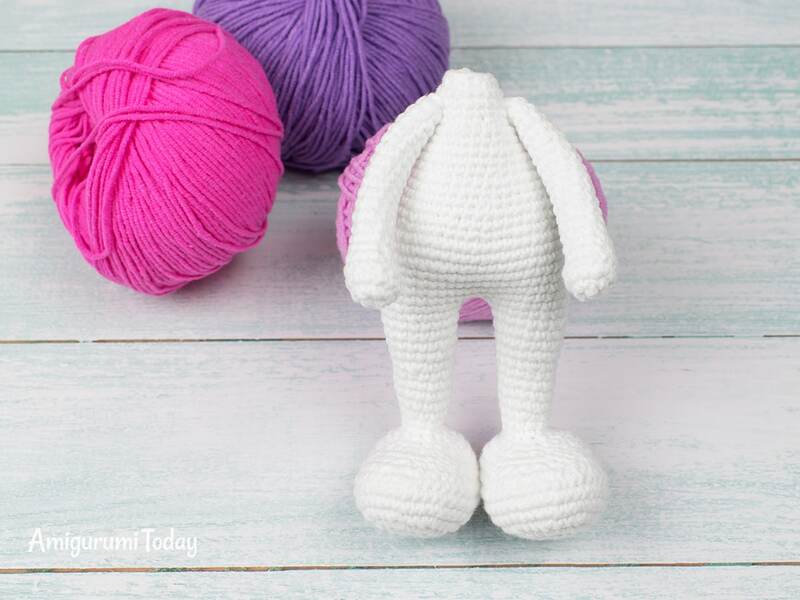 Thank you so much for sharing this super cute Bunny Pattern..
Hello! My rabbit is almost complete now. Yay! Thanks again for sharing this pattern and answering all of my questions along the way. I have one last question as I finish up. Where did you get the pastel chalk you used on the cheeks? I have no idea where to begin to look…or what to look for. I appreciate any help/info you can provide me with on this. Thanks in advance! P.S. Will this chalk get messed up if put in a child’s mouth…as in run on the clean, white yarn? Just curious. Hi Brittany, please try to find soft pastels in a stationery shop. Note that they should not contain oils. Thanks for sharing the pattern. Wish there will be pattern for a shirt and pants for a boy bunny too. does this mean 2 sc in the first 12 stitches? Or does it mean sc in the first 4 sc flo, then increase do this for 12 times and just sc in the last 20 stitches? 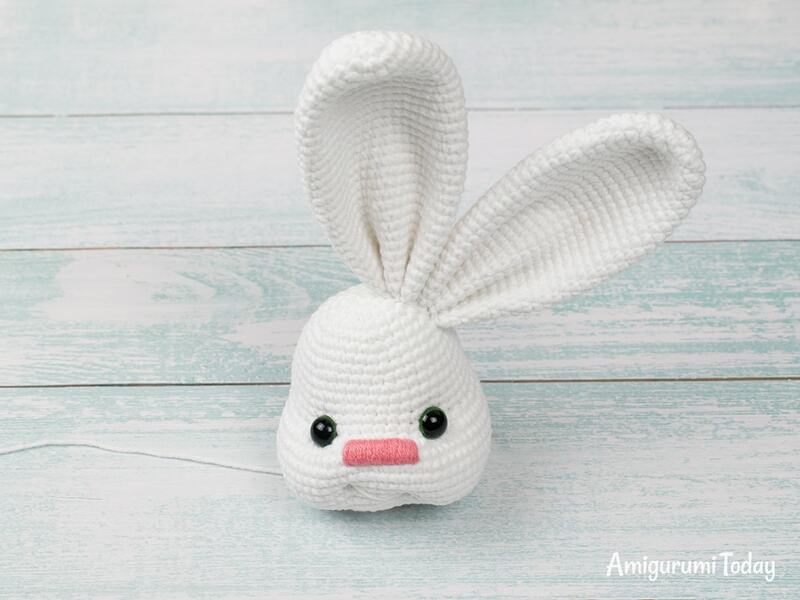 I just finished my first bunny and love it! It was a challenge! The face was easier than I thought it would be. I used wire I stripped from electrical wiring–it was coated. My bunny stands on her own! I made sure the wire extended into the head, which helped to stabilize it. Thank you for the pattern! Hi Julie, you should make 12 inc in front loops only, then 4 sc, further 12 inc FLO again, and finally 20 sc. I am also baffled Julie did you work it out.?? After looking at all the wire options I decided on electrical wire too. I noticed in one of the previous comments that you said that you don’t have ‘a boy version’. Would you have a pattern for overall shorts that would fit this bunny? I love pretty bunny but I have only have a little grandson. I’ve finished the head. It’s smaller than I thought it would be. What is the overall length of the bunny? If I wanted the bunny to be larger, could I use 8 ply instead of 5 ply. If so what size hook would be best? I finished my handsome bunny and very pleased with him. I would love to post a picture to show you. 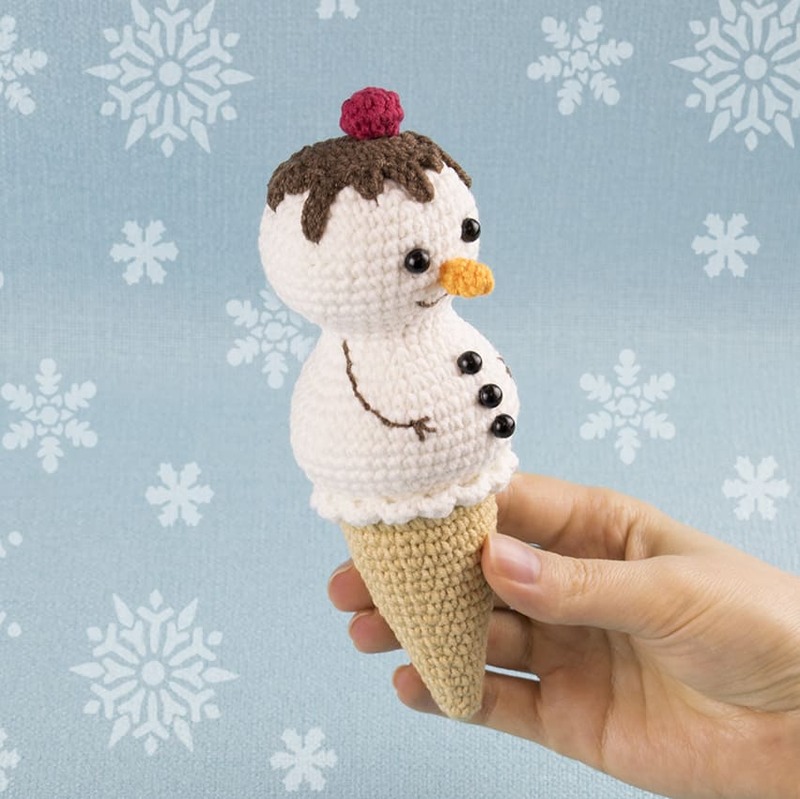 This is a beautiful pattern, very kind of you to make it available like this for free! Crochet the body till the arms. You will see what size of wire frame is OK.
What a fantastic pattern, thank you so much, I have just completed the bunnies and about to start the clothes. I have been crotchetiness for 50 years, so I’m going to adapt an old pattern I have to make boy clothes with a cap and boots. Hope it turns out as good as yours, and know that my grandson will love it. Again thanks. Would love it if you shared! I’m new to the art of “Amigurumi”. I am amazed at what you all can create with one hook and tons of imagination. 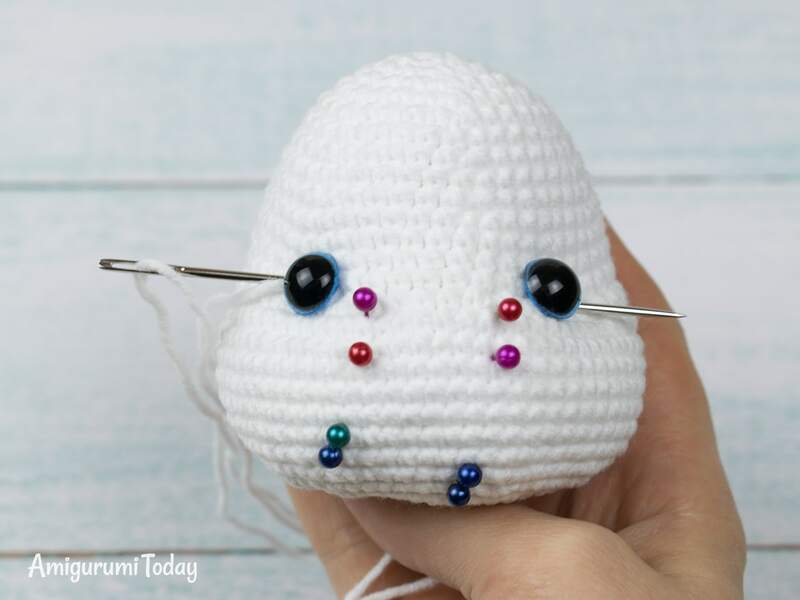 Thanks for sharing this super cute pattern. I love this bunny. Thank you so much for the pattern I’m wondering when and how to put my safety eyes in. Do you use safety eyes? These are half-beads which were glued. Hi there. Just love this project and definitely intend pin making them. Just have a couple of questions/concerns. I’m concerned about using wire in the toy, Is it child safe? Just concerned for children playing with them. I will also use safety eyes on the dolls for safety reasons. But love it to bits. Can you please let me know about the wire and whether it can be made without the wire and still get the desired affect. Hi Judy, if you insert the wire, it will be behind the fiberfill. Moreover, you can isolate the wire carcass with tape. Sure, you can make the toy without wire carcass, but it won’t be able to stay alone. The neck needs some support carcass any way. Hi, you can use any of the described techniques. As for the knitted skirts, they were sewn to the dress. it says the crochet hook is 1.5mm but on the cotton slip it says 3.5. Which one have you used? Thanks och thanks for the lovely pattern! Hello!! First of all, thank you so much for this pattern. Absolutely understandable and so so beautiful. I just finished the bunny and started making the shoes. But I just realised they’re a bit too big for the feet! The number of rows made them too “tall” for the feet, or did I count it wrong? Thanks in advance! Hi Maria, do you use the yarn of the same weight as for bunny? Hello ! Mine are very very big too . I had to do the shoes differently . I love the dress with the ruffles and owl button. is there a pattern for that dress? 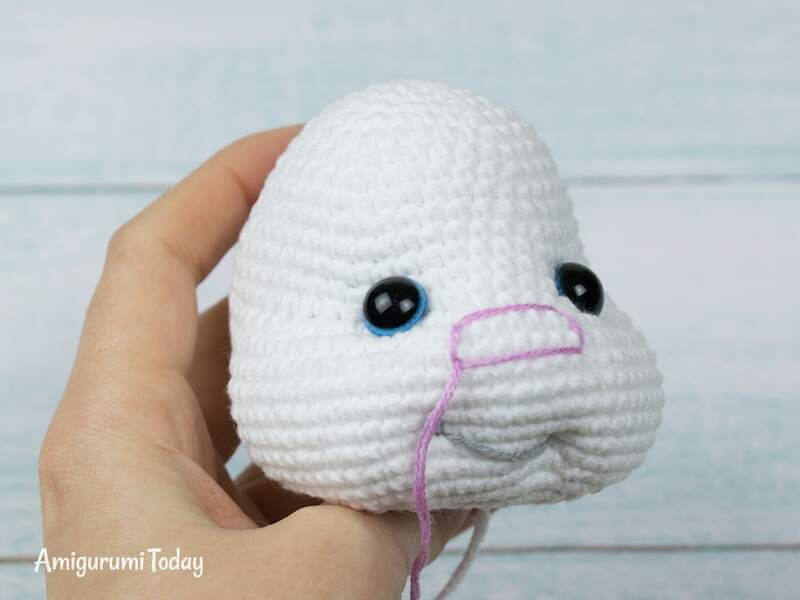 Can I use DK (8ply) for this pattern and maybe size 3-4mm hook? or would it turn out too big? Yes, in this case your bunny will be huge. This bunny is lovely! I’m all done except for attaching the head….I saw in previous comments that it’s sewn on, but I do not see in the instructions when that is done. I assume after the face is complete? Hi Mary, yes, the head is sewn after the face is finished. I figured out how to read your pattern and finished mine, and I had a good piece of thick pipe cleaner sticking out to hold the head. Unfortunately, it’s not enough to hold the head up stable. Now I have to rework the head/body part. It would be helpful to others if you could explain this section so people won’t have to redo this major part of the process. Beautiful Bunny once complete. I am wanting to make one of these cute bunnies for my granddaughter. What gauge wire did you use? I’m stuck on round 15 of the head. I am so confused……….Please help and thank you. Hi Gem, what part of the Rnd 15 is confusing? Is there a boy version of this bunny pattern? Hi Peggy, do you mean head? I have translate this pattern to Swedish and I wonder if I can share it in a group on Facebook, named “Virka mera” witch means Crochet More. There are mane people in Sweden who has difficulties with foreign laungages. Hi Anja, sorry, this is not allowed. Hope for your understanding. Thank you for providing that link for the contractions. It was perfect. I just finished making the face and it turned out great. Thanks so much for sharing this pattern. Also, what did you use to tint the cheeks. Thanks in advance! Thanks for kind words 🙂 It’s a soft pastel. Just finished and I love the pattern. Some of it took me several times to figure it out. Thank you for sharing. I see there are so many questions and I really hate to ask another one but this bunny is so precious! I am on row 9 of the legs where I begin with 42 sc. Row 9 tells me to sc in next 12 st then decrease. Repeat 9 times then sc 12 to get to 33 sc. It’s not adding up. I would have to start out with over 70+ stitches. Can you help me please? Hi Trish, please double check it. You should get 12 sc, 9 decreases, 12 sc. Please help! How do you make the contractions for the face? I have read and re-read the instructions and tried looking up the technique on the internet, but can’t find anything. I need a little more detailed instructions. Help…I’m stuck on Round 15: Could someone please tell me how to do this row. I have tried and tried to figure it out and I just can’t up to 72 st.
Hi Linda, the total number of increases in the Rnd 15 is 24. Did you make all of them? Thank you so much for helping me out here. I really appreciated the help!! do you have a pattern to make boy clothes for the bunny? Overalls perhaps? So I love thIs!!! I attempted this without the wire and the head was way to heavy to hold up on the body so I had to sew it on tighter loosing the neck and petite look. Does the wiring help this? And where would I find the wiring I’ve never used wiring before I have all the peices ready for my second one just need to find the wiring it’s left me at a halt help!!!!! You can find a wire in home and garden shops, and also in handmade shops. Hi Conitta, the total number of stitches in the Rnd 3 of ears is 18. You have to do increase 3 times (= 6 stitches), then sc in next 3 st, again increase 3 times and sc in next 3 stitches. Hi Charlotte, the thickness of wire is 1.2-1.5 mm. I am confused with the legs….says rounds..but starts with 9ch…are there any videos? And are they started at feet or top of legs? 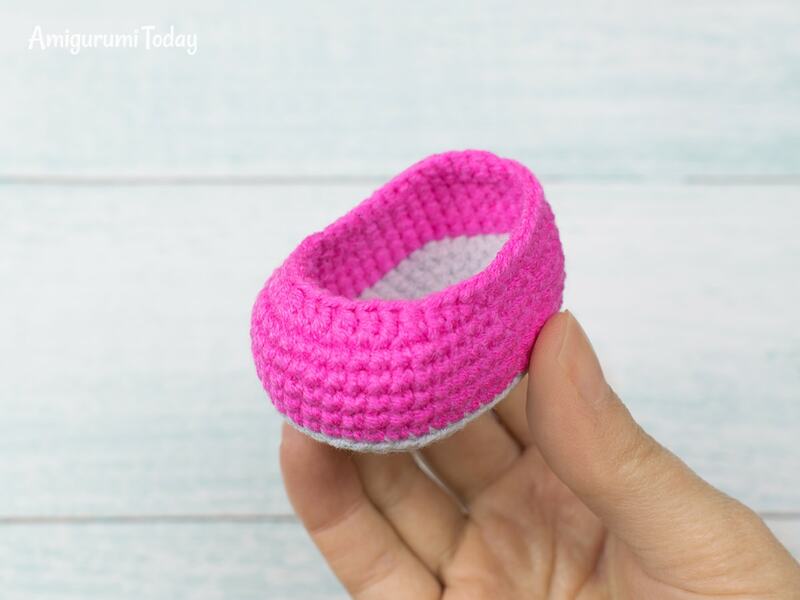 Hi Regina, this pattern is designed for advanced level crocheters 🙂 If you never crocheted oval feet please see any video-tutorial how to crochet the baby shoes. This is the same principle. Regina, you start with those 9 chs and work along both sides of them. It makes an oval, sort of like what you would for the bottom of a purse or shoe sole. I am very interested in the dress pattern for the first picture The one with the three different layers of skirt i have tried but i cant seem to get them to ruffle quite like yours could you post the pattern for the one with the the light pink blue and dark pink ruffles. I have really enjoyed making this. I cant wait to get home from work to do it. Hi Tracy, the second dress pattern describes the skirt ruffles made with hook. Hi Elsa, assemble these parts while crocheting. The pattern describes these steps. How do you do the neck piece? He body just sort of stops and no further instructions. Any help please? The body includes the neck. Hi Darlene, could you please explain what do you mean? The Rnd 4 of the leg says to make increase 10 times. Did you make them? Do you have a tutorial on YouTube for this Bunny ? Where did you get the instructions? 🙂 Please use this website instructions. To understand the principle of making feet you can see any baby shoe video-tutorial. Hi Margie, if you want it to stay alone you need to insert firm soles in the feet and add heavy-weight granules. Thanks for the beautiful pattern! I’m wondering how to make the owl on the pink dress….I didn’t see it included in the pattern. If you could tell me where to find it, I would greatly appreciate it. Hi Connie, the upper part of the pink dress is crocheted the same way as others. The lower part consists of three skirts. They are knitted (not crocheted ) with garter stitches. You can crochet them using the second dress pattern (which is on the bottom of the article). Just make three skirts of desired length. I Iove this pattern, however I am new to crochet. I am stuck on “Rnd 1: 9 ch” step on the leg. Do you have a tutorial for dummies showing this step? Hi Andrea, you have chosen very difficult pattern to start with. 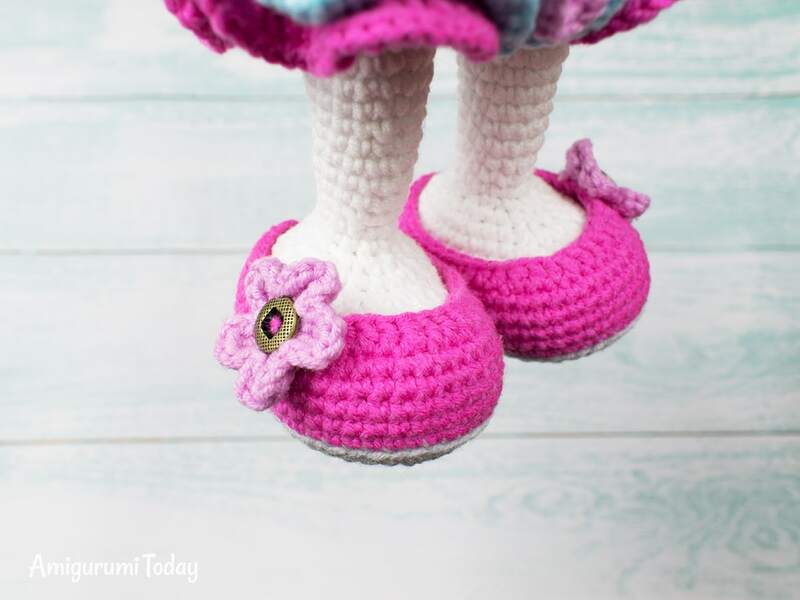 To understand how to crochet feet and shoes please see any video tutorial that shows how to crochet baby shoes. It will help a lot. 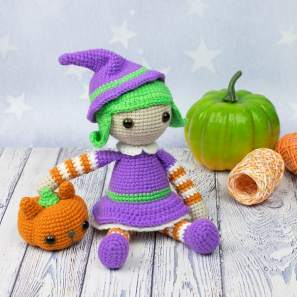 Hi, I love the little purple and orange dress can you tell me where I can get the pattern please. I wish I could find someone to make 2 of these bunnies for me I will pay them. I don’t know how to crochet. I made 6 of this Bunny !! so adorable. Hi Patty, you should make increases crocheting in front loops only. Other stitches are single crochet. Hi Cheryl, you should make 12 inc in front loops only, then 4 sc, further 12 inc FLO again, and finally 20 sc. This is gorgeous! I can’t wait to make it but I would really love the pattern for the purple and orange dress, second from the top. Cute as a button. I have to make several for grandkids. Hi Deb, the upper part of the pink dress is crocheted the same way as others. The lower part consists of three skirts. They are knitted (not crocheted ) with garter stitches. You can crochet them using the second dress pattern (which is on the bottom of the article). Just make three skirts of desired length. How is the head attached? Is it glued or sewn? Do you have a pattern for the purple blue orange and green dress??? 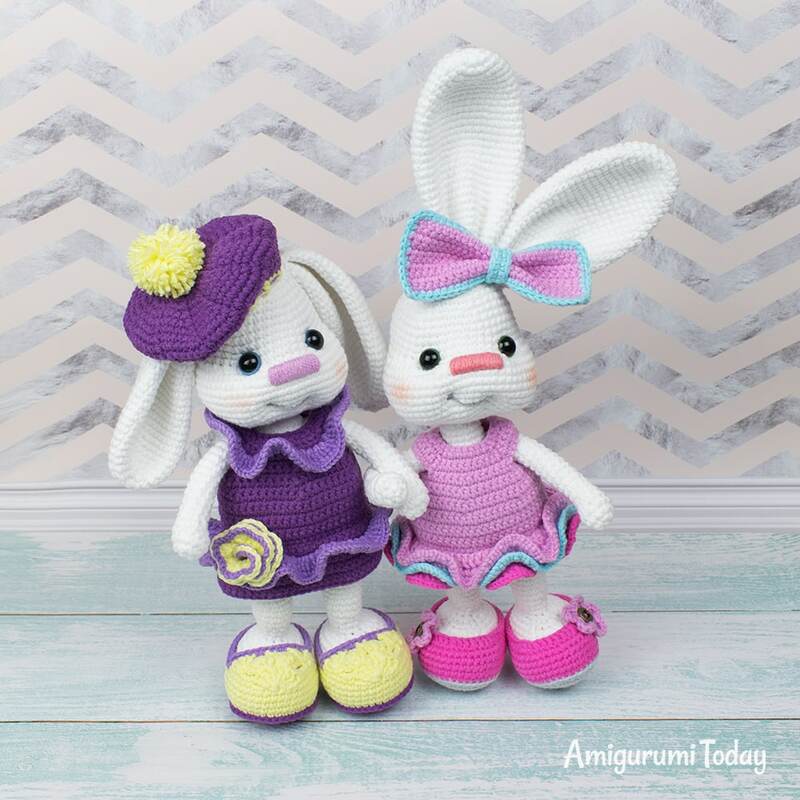 Also do you have the second bunny in the purple dress pattern.? 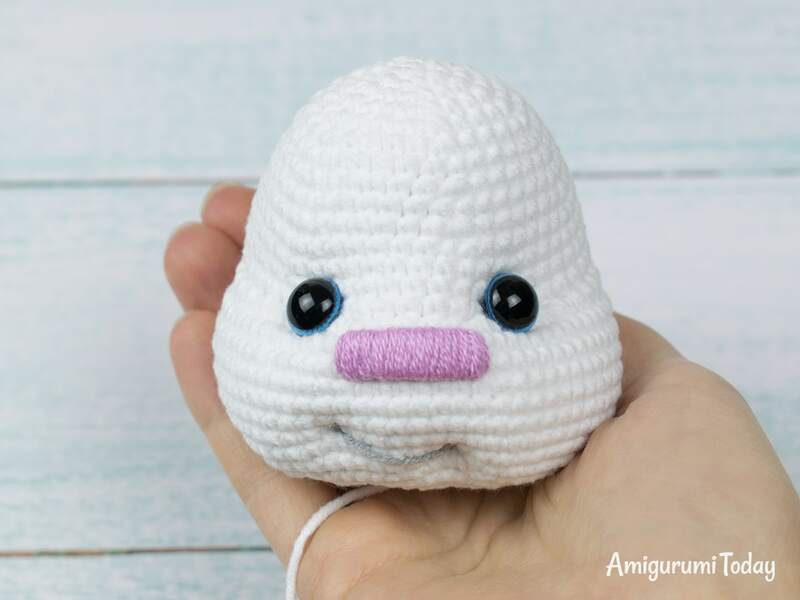 I’m enjoying looking at the amigurumi dolls and animals. Very interested in making some for myself and my grandchildren. I’ve been crocheting for over 45 years. I’ve made baby clothes, blankets, pot holders, slippers, mittens etc. and would like to try something different. I think I’d truly enjoy these little ones that seem to come alive!! Only problem – when I go to get the free pattern I don’t have any luck printing one out. When I hit “get PDF” it moves me to another screen altogether. 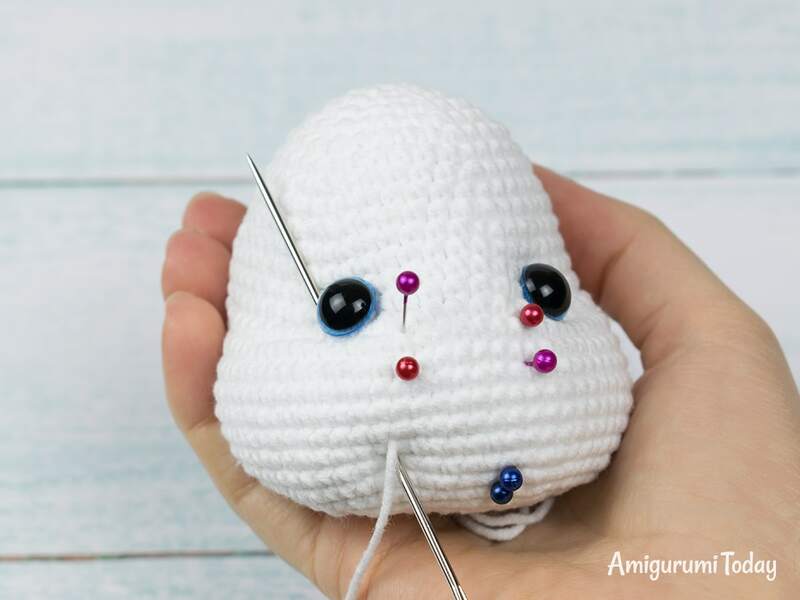 Please help me if you can I’d love to try to crochet an amigurumi doll. Hi Natalia, unfortunately, this is forbidden. Hi, I have not tried this yet but would like to. I am in Australia, what ply is this? I would really like to make a meerkat, is there a pattern somewhere? Can anyone help with how to do the muzzle part where in says inc etc. very confused. To shape the muzzle you need to find Rnd 15 of the head, the place where 4 sc are located between the increases. Taking into account their location you should mark the points of contraction. Can we please have the instructions for the outfits shown in the first picture. Hi Marilee, the upper part of the pink dress is crocheted the same way as others. The lower part consists of three skirts. They are knitted (not crocheted ) with garter stitches. You can crochet them using the second dress pattern (located on the bottom of the article). 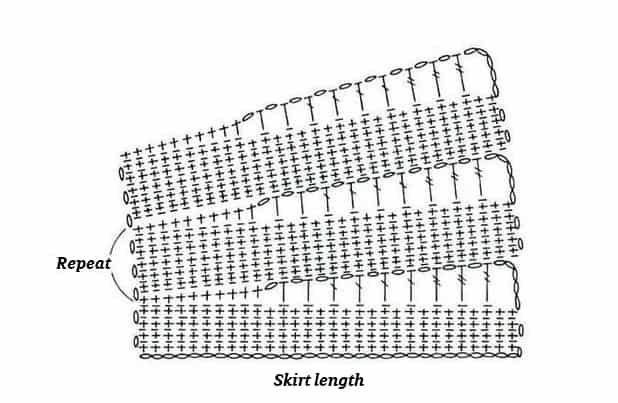 Just make three skirts of desired length. Is there a way to get a printable version of this pattern? Thanks! Hi Debbie, see the information in the post. Of course, I will add the link to your pattern in the translation. Hi Anja, translation is not allowed. I love this pattern. I’ve never done a pattern with these face contractions before, I’m a little confused fused about the muzzle section. 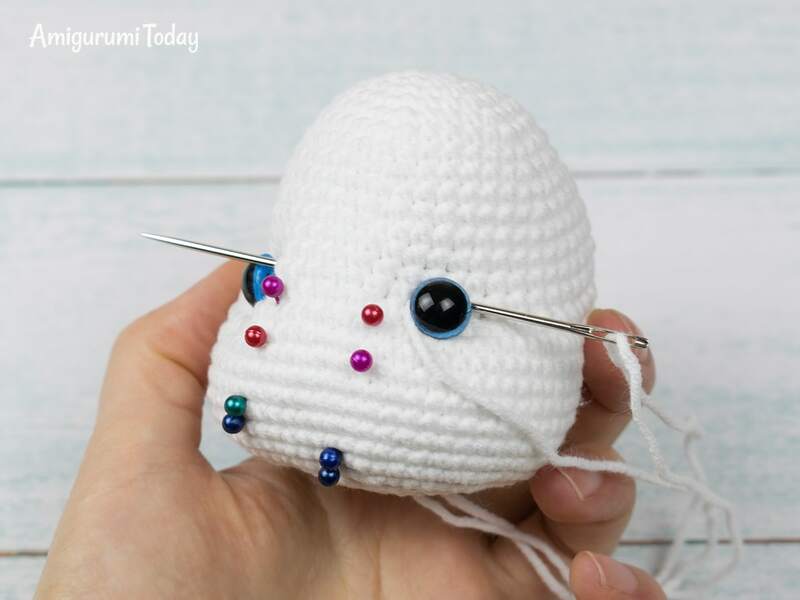 Are there any video tutorials anyone knows about showing how to do the increases in room of the face and the contraction stitches? Thanks! I tried thos pattern with a size 3.25mm…way to big. I wonder where i could get a crochet hook small enough. This is adorable! I would like to make it a boy bunny for a little guy. Do you have a pattern for just a shirt vs a dress? Hi Nicole, sorry, I don’t have. Hi Annette, the upper part of the pink dress is crocheted the same way as others. The lower part consists of three skirts. They are knitted (not crocheted )with garter stitches. You can crochet them using the second dress pattern (on the bottom of the article). Just make three skirts of desired length. Thank you so much for sharing your pattern! I am going to love making this cutie. One question, what type of wire should I use? This is the first project I am attempting to use wire with and want to make sure I am buying the proper materials. I think pipe cleaner is the best if you have long enough. But you can also use any other well-bending wire with coating. Cant wait to make them. They are so cute. What size crochet hook. You show 1.5 mm but I think that would be too small. This hook was used to get very tight stitches. If you think this is small, you can use 2.0 mm or any another according to your yarn weight. This so beautiful! I really want to make this for my granddaughter! Thank you! Fantastic patter and such detailed instructions and just in time for Easter. How many hours does it take to create? It depends on your skills. You have to do a big work anyway. Would love to order this bunny and cute owl. Does anyone know who made these?? Tutorials on the bunny and the dress and shoes. Your website is very nice. Nice projects, thank you. I did not see the patterns for the other dress patterns, could you please include them or sent them to me. It’s in the bottom of the article. Hi, I updated the shoe pattern, please have a look now. OH my gosh, these are so adorable! Thank you for sharing this sweet pattern! I would love to try to make a couple of these for my grandchildren! I hope they turn out as sweet as the ones you did, as I am not a confident crocheter! Thanks again! Luv the pattern!!! 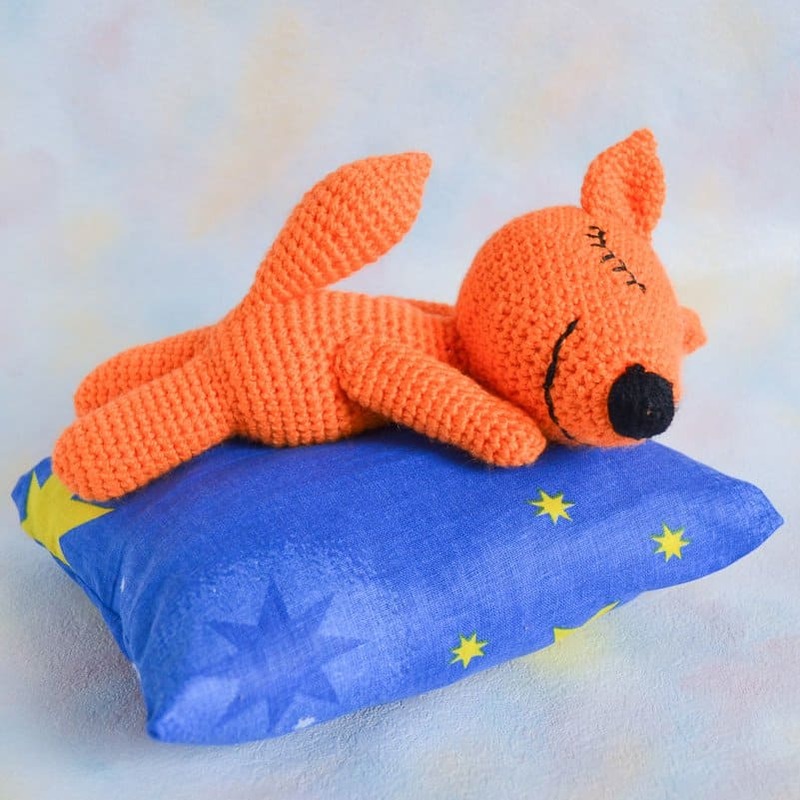 Thanks so much for the pattern… Do you have pictures of how the ears are place? Having trouble with placement on them!!! Hi Crystal, the photo instructions for ears were added. Thanks a bunch!!! How tall are they when complete? They are about 30 cm depending on the yarn weight. Thank you for this pattern. I can’t tell what weight this yarn is, is it worsted/dk? I’m trying to find a comparable yarn here in the states. This is fine 5ply yarn. Hi! I just bought the yarn for this and I’m using premier cotton fair for the body and Michaels brand loops and threads woollike yarn. Hope that helps you! Thanks. They didn’t have that at my Michaels, but I’ve been eyeing it on Amazon. I’ll give it a try. What size hook did you use Teresa? These are absolutely adorable, thank you for sharing your patterns, you are very generous. Do you ever do a lamb?? Or maybe a Border Collie dog? I am from Australia and will share your page to lots of my friends. Hi Vickie, if you wish you can not to use the wire frame. The wire frame is used to make the arms and legs bendable and steady. Thank you so much for a quick response…and again I love the patterns you offer. Hi…I do have a question..I live in the United States..Iowa. Where can I order these yarns at? Could you please email me at [email protected]. I have tried online searches and I can’t find anywhere to order these yarns at. I really appreciate your help! Linda, I used Deborah Norville’s Everyday line of yarn and it worked out great. I also used a D/3.25mm hook. It came out to be about 14.5 inches tall and then the ears are another 5.5-6 inches. I really like this Bunny. But I have a little question, how should I start the leg? I don’t understand the instructions. Hi Manuela, start with the chain and crochet in spiral on both sides of the chain according to the instructions. Hi there. This pattern is georgous. Did you manage to post up the other dress patterns by any chance. Hi, the Rnd 26 of the body is correct. In the Rnd 27 you work on the 3 ch on one side first, then on the same 3 ch on the opposite side. Hi Wendy, there is no wire in the ears. Fold the ears slightly at the edges before sewing. Hej, hvor kan jeg finde oversættelsen til denne hæklet? Darling pattern! Would also love the patterns for the other dresses and bows pictured with the pattern. Is there any way to get those? Hi Kyra, I will try to make a post with another dress pattern. Thanks for the message. Wonderful! I would love to know when you do. I was looking for the pattern for the pink dress but I didn’t see it. Have you posted the pink dress pattern? Hi Lindsay, the upper part of the pink dress is crocheted the same way as others. The lower part consists of three skirts. They are knitted (not crocheted )with garter stitches. You can crochet them using the second dress pattern (on the bottom of the article). Just make three skirts of desired length. Thank you so very much for sharing this lovely pattern. I am learning so much working on this. Can you help me by giving me some tips on making the wire frame, I’m not sure how to calculate the size. Hi Cathy, you will need about 1.5 m of wire. Adorable! What gauge wire are you using? Thank you so much for this pattern. I have almost finished making this beautiful rabbit. As a pattern creater myself i know just how much work goes into this. Thank you for making it avaliable. I would like to get the PDF but would like to pay with paypal. Geweldig bedankt voor deze super lieve Bunny !! That link is not working! Please tell me how to get these other dress patterns. I tried getting into the community, but the register button is failing. Please read the prev comments. 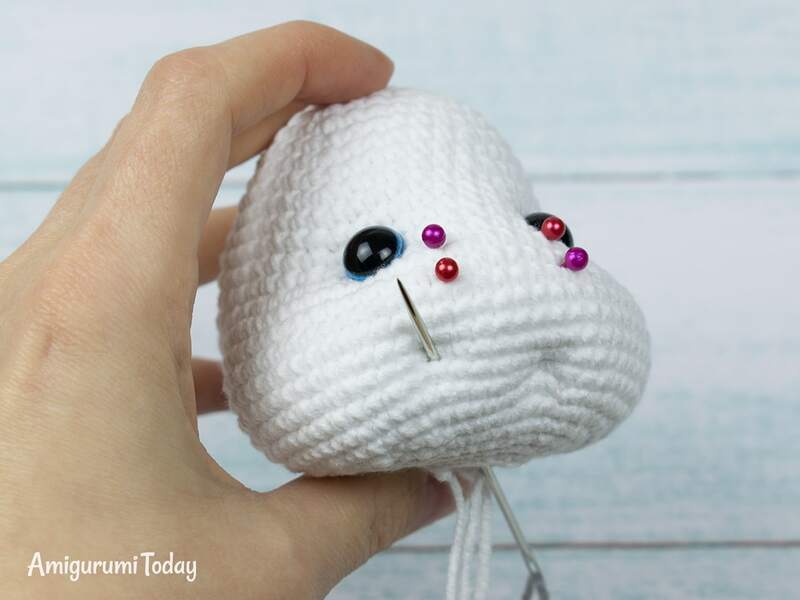 this pretty bunny is so great I have a great grandaughter who uses her mouth up on one side just like this pretty bunny I haven’t tried this technique, but have been crocheting for 70 years and your instructions are so great I will give it my best. Thank you so much. 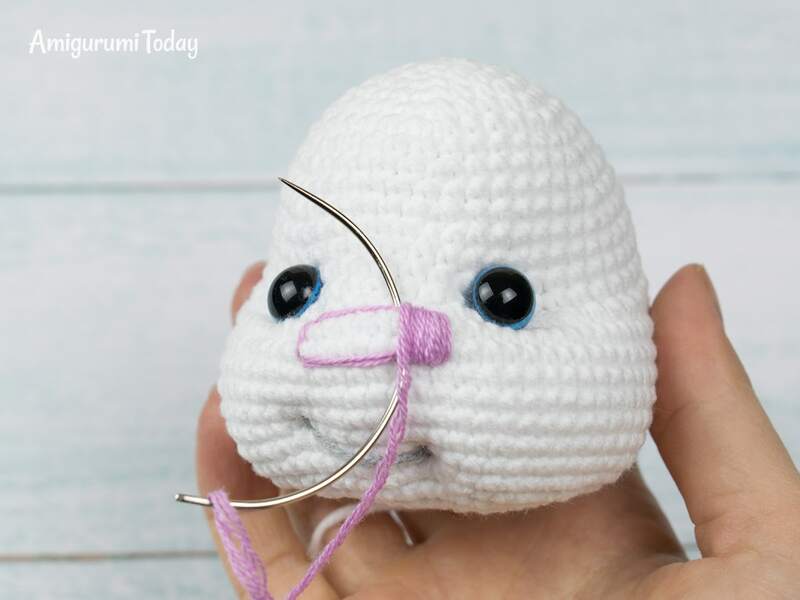 This bunny is gorgeous and the tutorial and pattern are great. Thanks so much for sharing this pattern. Thank you all so much for being so generous with your patterns. Hola! Soy de México, me podrían mandar la información en español, me interesa comprar algunos patrones, gracias.